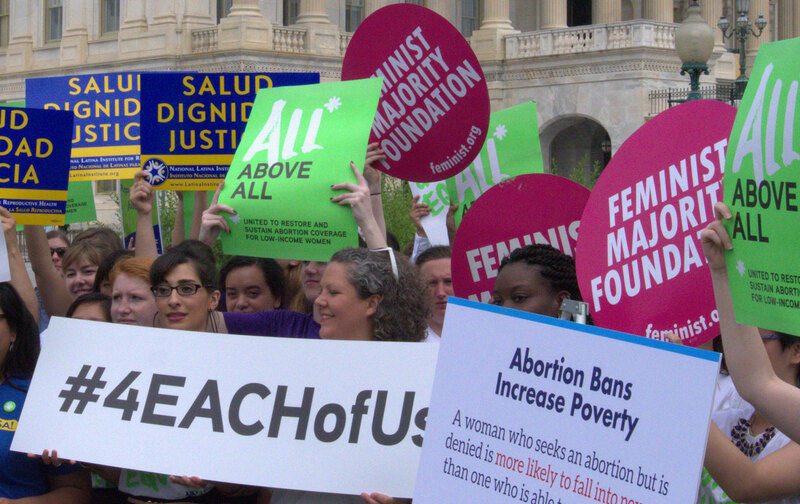 The EACH Woman Act would ensure health coverage of abortion for anyone regardless of what they earn or where they live. In the Republicans’ quest to defund Planned Parenthood, they keep repeating one of many fallacies: that federal dollars are being used to pay for abortion care. Because of the decades-old Hyde Amendment, they’re not. But that doesn’t mean that’s the way things should be. There are millions of people—many of them poor women or women of color—who are denied their full range of reproductive options because of this destructive law. A bill introduced this summer seeks to change that. The EACH Woman Act would repeal the Hyde Amendment and ensure health coverage of abortion for anyone regardless of what they earn or where they live. Right now, people who rely on Medicaid for their health insurance are forced to either scramble to pay for an often prohibitively expensive procedure or carry an unwanted pregnancy to term. The EACH Woman Act would ensure coverage for abortion services for them, as well as for federal employees, Peace Corps volunteers, people in federal prisons, and anyone else who relies on the government for their healthcare. The bill would also prohibit states from interfering with private plans that cover abortion. Currently, 25 states restrict abortion coverage by private insurance companies operating in their state. Join The Nation, Planned Parenthood Action Fund, NARAL Pro-Choice America, and a host of other groups in calling on Congress to pass the EACH Woman Act. Then, to get even more involved in the fight for reproductive justice, check out Dani McClain’s list of four ways you can support Planned Parenthood. On top of lying about Planned Parenthood’s funding, anti-choice politicians have been vilifying fetal-tissue research. This is despite the fact that, as Katha Pollitt points out, the practice has been legal since the 1930s, has contributed to the development of a number of vaccines (including the vaccines for polio, the chicken pox, and measles), and is currently being used in research for treatments for Parkinson’s, HIV, cancer, and diabetes. And as Katrina vanden Heuvel argues in her column at The Washington Post, the recent attacks on Planned Parenthood are not the only way anti-choice politicians have been going after reproductive rights. She points out that states have enacted 287 new restrictions on abortion access since 2011, and one-and-a-half abortions clinics are closing every week.